Legendary American speed skater Apolo Ohno doesn't know if he'll ever return to competition, but that's OK because he's happy doing things like promoting the Special Olympics, Lei Lei writes. He still has that soul patch and he's still smooth on the ice. 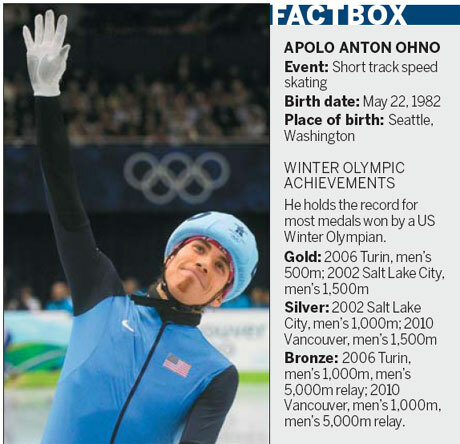 And last week, Apolo Anton Ohno was back in China. This time though, it wasn't winning or losing that was at stake, but something more special. As an ambassador for the Special Olympics - the world's largest sports organization for children and adults with intellectual disabilities - Ohno was here to promote the event among Chinese people. "I try to spread a global awareness about Special Olympics," said the 29-year-old two-time Olympic champion. "As an ambassador, I try to teach and educate people and media about how important it is to always have a place for these athletes to perform, to play and for athletes to have fun." With two gold medals, two silver and four bronze, Ohno is the most decorated Winter Olympian in US history. But for Ohno, who was named a Special Olympics ambassador in 2010, the focus right now is not on the ice, but on that group. "For me, what the Special Olympics stands for is much bigger than just sports. It gives these kids an opportunity that maybe otherwise they wouldn't have and to give them something to strive for, a goal," he said during a promotional event in Beijing on Monday. After skating with some Special Olympians in Beijing, he also went to Jilin City in Northeast China to hold clinics with the speed skating team of China's delegation to the 2013 Special Winter Olympic Games in Pyeongchang, South Korea. Raised by his father, Ohno began training full time in 1996. He has been the face of short track in the US since he won 1,500 meter gold at the 2002 Winter Olympics. In 1997, at the age of 14, he became the youngest US national champion. He was the reigning champion from 2001-2009, and won the title a total of 12 times. In December 1999, he became the youngest skater to win a World Cup event title, and became the first American to win a World Cup overall title in 2001, which he won again in 2003 and 2005. He also won his first overall World Championship title in 2008. After winning two bronze medals at his third Winter Olympics in Vancouver in 2010, Ohno shifted his focus away from the ice. "I'm taking a break from speed skating. I love speed skating. I love short track. I love the Olympics. But now that I have more time I am able to put more effort and energy toward things like Special Olympics," Ohno told China Daily. "I did a couple of films - television and movie films." Working with the Special Olympics has shown him there are more important things than winning races. "It's amazing how big the Special Olympics is - it started from a small idea and now it's gone global," Ohno said. "I always believed in the Olympic movement. It just touched my heart. I saw a lot of opportunities for athletes to learn about it. I saw a growing organization that needed help and needed support from athletes like myself. "When I first witnessed it in person, I saw how inspirational that some of the athletes are, how hard they work and how much they love to just want to play. It gave me perspective on my own life. "These athletes are here because they want to compete. I spent all my life as an athlete trying to win. That was all I cared about being No 1. What I think now in a very simple way, just enjoy the sport for what it is." Ohno ran his first marathon last November in New York last November, finishing in 3 hours, 25 minutes and 14 seconds. "If I finished under 3:30, my sponsor would donate $1,000 toward every mile. I did it, so they donated $26,200," Ohno said. As for the 2014 Sochi Winter Olympics, Ohno said he hasn't decided what he would like his role to be. "The next big competition is Sochi 2014. I will be there no matter what. I'm not so sure if I will skate or one of these (promotional events)," he said. "I don't know yet. I haven't officially retired. I never say never. As it is right now, it's not my main focus. My focus now is programs like the Special Olympics. My focus is some of the things I always wanted to pursue that I didn't have the time for in the past, like TV, films and business." Ohno said he still misses his Chinese coach, Li Yan, who worked with the US short track speed skating team from 2003-2006. Li is now coaching the Chinese team and spearheaded the Chinese women's team back to the top of the world at the Vancouver Games, where it bagged all four women's short track titles. "Li is a wonderful coach. She was like a mom to our team, a very strong woman," he said. "I have a lot of respect for her. She is one of the best coaches in the world."